...Set: Supernatural 6x07 "Family Matters"
Guys, I miss Sam. The real Sammy. This robo-Sam is just making me sad. And I kind of can't wait to see what he really feels about his time in Hell. Assuming he gets his soul back anytime soon. Oh yes, that's right. Our Sam is soul-less. Without a soul. Missing that thing that makes him feel and also, incidentally, sleep. Who knew your soul equaled sleep? The more you know! This episode was all about the various Samuels running around the Supernatural-verse, starting, naturally, with the Samuel of the Winchester variety. Dean got Cas to come down from on high to give Sam a little hand-in-the-body examination, which told him that Sam is without his soul. The only lead they have to go on is that Sam wasn't the only one to mysteriously rise from the dead, so they bring Cas on over to take a gander into the Samuel of the Campbell variety too. It turns out, his soul is just fine, so Cas wings back off to Heaven to deal with his brewing angelic civil war, which of course Dean gets snippy about. Ah Dean, you really do think it's always about you, huh? At the Campbell compound, there seem to be cousins roaming all over the place. Clearly something big is about to go down. Samuel informs Dean and Sam that they are about to go after the alpha vampire, but he doesn't want them involved. Or rather, he doesn't want Dean involved. But Dean manages to get them in by saying he'll do whatever Samuel asks him to do, even though he later confesses to Sam that he doesn't trust Samuel one bit, and knows he's hiding something. Obviously! When the raid goes down, however, Dean gets pushed to the sidelines of the fight with Gwen, unable to see what's going down. 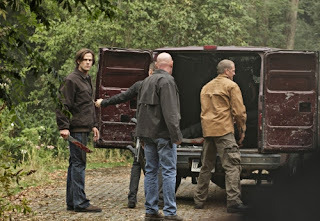 Being Dean, though, he decides to take a quick look-see and manages to spy Samuel et al capturing the alpha vamp and stuffing him in their van, rather than killing him like they had said they would. Sam was also part of this deal, which Dean later confronts him about. Sam straight up lies about the whole thing, but is forced to tell the truth when Dean tells him he saw what was going on. And at this point, Dean has had it. He gives Sam the choice to either be with him 100% in this thing and tell him what's going on, or to go with Samuel and be done with it. At first we're given a fake out scene where it looks like Sam has decided to join Samuel, but it turns out he was only doing that to try to get in on the whole alpha vamp torturing business that was about to go on. 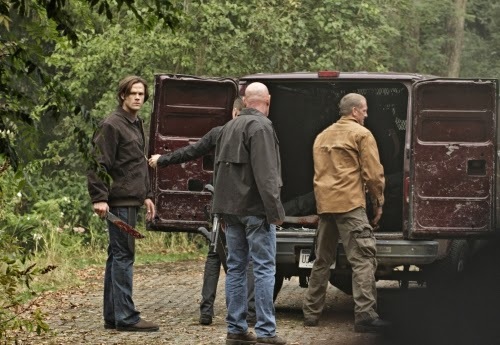 Samuel shuts him down, so he and Dean get sneaky and follow them to where they're keeping Mr. Alpha Vamp. Before the Winchesters get their turn with the alpha, they overhear Samuel grilling him, asking him where something is, though we never hear what he's asking about. But when Sam and Dean get their turn, alpha vamp spills. Samuel wants to know where Purgatory is, which, we're told, is where all of the souls of vampires and such go after they die. But the alpha doesn't know where it is, he's just as keen to find out. 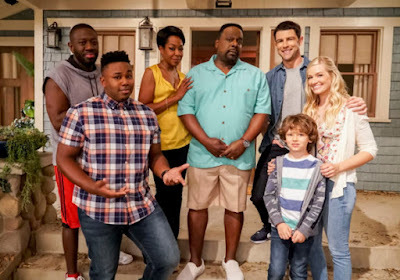 He also tells the boys that someone is pulling Samuel's strings, but before they can try to get him to say who, they're discovered by the Campbell clan. It's the Campbells vs. the Winchesters in a standoff, but only a brief one, because the alpha vamp has managed to break free, as we all knew he would. He kills off a couple stragglers, and just when he's about to go medieval on the rest, suddenly a bunch of demon-y Campbells appear to whisk him away. And that is when the twist of the evening comes, in the form of Crowley, who happens to be the one pulling Samuel's strings. It turns out that Crowley is also the one who brought both of the Samuels back, and that he has his hand squeezed all nice and tight around Sam's soul down in the cage. He's trying to find out where Purgatory is, and using Samuel to do it by gathering all of the alphas he can find. Because apparently he thinks one of them must know where Purgatory is? I guess. You'd think the King of Hell might be able to figure that one out, but whatevs! Basically he tells the boys that they have to work for him if they want to get Sam's soul back. After he's gone, they try to get Samuel to tell them what Crowley could possibly be promising him for him to work for him, but Samuel doesn't say. Sam wants to take him out for selling them down the river, but Dean lets Samuel go. He's family, after all. And their family is surely in short supply. Both parents dead, and now Sam without a soul. Whatever shall they do? - The soul thing gets murky for me. By what the alpha was saying, it sounded like the creatures and stuff have souls, but their souls are different, and that's why they go to purgatory rather than heaven or hell? Kind of confusing. - How long until Sam gets his soul back? I really hope it's not too much longer. Seriously, I miss his schmoopy face. You know the one. - What is Crowley lording over Samuel? My first guess goes to something with Mary, since they seem to all be about family. - The alpha vamp is planning some kind of war. To what end? Did I miss that, or did he say it was something to do with the purgatory thing? - Did we really need to see the alpha scratching at the bindings 5 million times to get the point?